Could John Wiley, the former UW-Madison chancellor, be called upon to lead the university on an interim basis? If grades are any indication of on-the-job proficiency, the students graduating from UW-Madison’s department of curriculum and instruction should be very, very good teachers. According to a Capital Times analysis of publicly available grade information at UW-Madison, the average grade awarded to undergraduates in this department — which develops the teachers of tomorrow — is higher than a 3.9 on a 4.0 scale. Similarly, the average grade awarded to undergraduates taking courses in UW-Madison’s School of Nursing last spring was slightly above 3.8. To put these numbers in perspective, if 18 A’s, one B and one C were dispensed to students in a class of 20, the average grade would be 3.85. 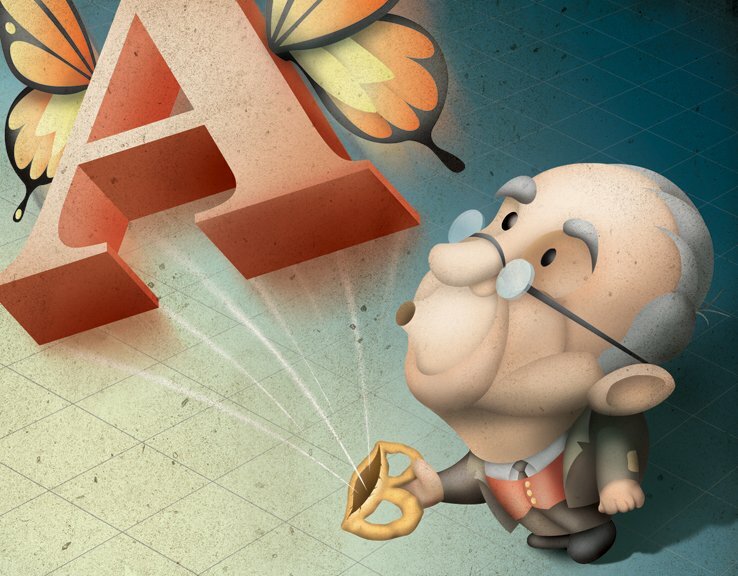 The paper’s analysis also found that a surprisingly high number of A’s and B’s are being handed out all over campus, mirroring a decades-long trend. In the fall of 1958, the average grade-point average for undergraduates at UW-Madison was 2.5 on a 4.0 scale. It was 2.9 by 1988 and by 2008, according to the most recent reports available, had reached 3.2. Add it up, and some on the UW-Madison campus are asking if the bar is being set too low. Some argue this trend is a clear case of grade inflation — the upward progression of students’ grade-point averages without an increase in achievement. Critics say these high grades have a negative impact on learning by rewarding mediocre work and sucking the competitive life out of classrooms; students have little motivation to work hard, the theory goes, because they learn quickly that they can usually earn at least a B by simply going through the motions. In fact, during the 2009 spring semester, 78.6 percent of all grades on campus were B’s or higher (A, AB or B). And students might not be the only ones skating by due to what some view as relaxed standards. Moses, who has had informal discussions with deans and others on campus about finding ways to address grade inflation, suggests professors who award higher grades make life easier for themselves, too. Moses says it is the responsibility of professors to set the bar and help students meet the stated expectations. But if that bar is set low and enough students are above it, “you minimize the amount of effort needed to help students achieve expectations,” he says. But not everyone on campus is convinced something is terribly wrong and many suggest there are plenty of good reasons to explain why grades might be going up. In fact, some point out the average ACT score of incoming freshmen went from 24.0 in 1988 to 26.8 in 1998 to 28.1 in 2008. It’s also plausible that professors have become better teachers than their predecessors due to an increased focus on pedagogy, and that as college courses and curricula have evolved, these changes have led to improved teaching and learning outcomes. 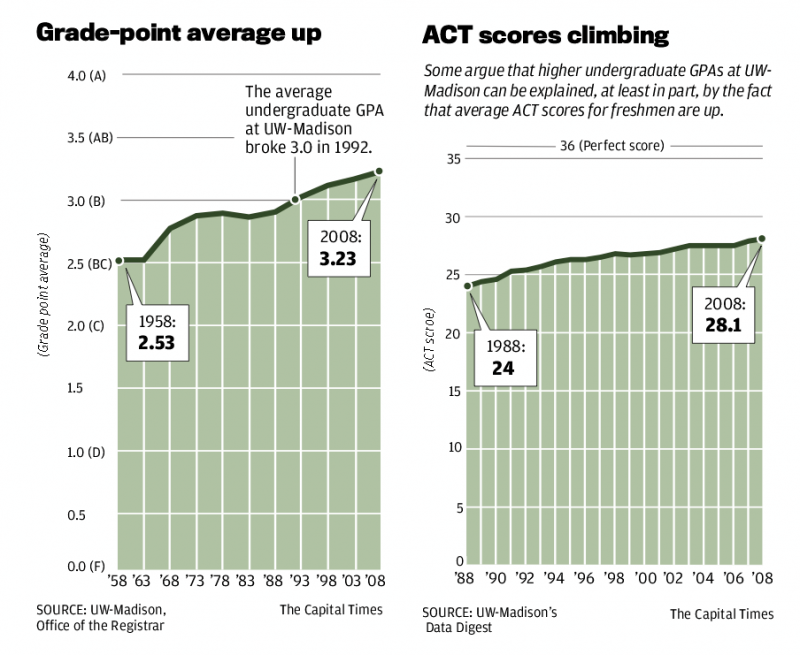 Besides, argues former UW-Madison Chancellor John Wiley, what’s the big deal if grades are going up? What’s worse, he says, is hearing stories from years ago when professors in some disciplines were ordered to “weed out” weak students from their classes by making sure at least 30 percent received D’s or F’s, or dropped the course. Gloria Ladson-Billings, the chair of the department of curriculum and instruction — which is housed in the School of Education — says she is not aware of anyone within the UW-Madison administration ever suggesting that her department is dispensing too many A’s. But Stuart Rojstaczer, who has researched grading trends across the country, has a different take. Ladson-Billings says that when students don’t show the makings of a good teacher they are “counseled out of the program.” She also argues that the vast majority of grades awarded — 81.6 percent last spring — in her department go to those classified as seniors. “Would you not expect seniors in their chosen major to get good grades?” she asks. Nadine Nehls, associate dean for academic programs in the School of Nursing, also defends the relatively high grades distributed to future nurses. She says her school also is a standards-based program that uses a predetermined grading scale. Wiley became interested in the topic of grade inflation during his days as provost, from 1994 to 2000, and later as UW-Madison’s chancellor from 2001 to 2008. So Wiley spearheaded a campuswide self-study that led to a 1999 report titled “Trends in Undergraduate Grades.” That analysis found that between 1990 and 1998, there was a steady increase in undergraduate grade-point averages at UW-Madison, from 2.90 to 3.11. Even though the average SAT score of students on campus also went up during that period, the report indicated not all of the growth in grade-point average could be easily explained. Additionally, the report indicated that there are wide discrepancies in grades across campus due, perhaps, to variations in how the departments and professors, themselves, view grades. These grading disparities, especially between departments on campus, continue today. So while the department of curriculum and School of Nursing hand out large numbers of A’s, the average grades awarded in the departments of mathematics (2.78), chemistry (2.92), economics (2.93), nutritional sciences (2.93), and geology and geophysics (2.96) were below a 3.0 in the spring of 2009. Likewise, while the average grade given out in most departments increased over the past 10 years, there are a few departments on campus — chemistry, computer science, anthropology and political science, to name a few — that recorded slight declines. Part of this variation could be linked to the fact that there is no uniform grading policy across campus — something some students wish would change. Some argue grades are a good way to differentiate students once they hit the job market, while others believe grades should mainly be used as a tool to motivate students. Still others contend the main purpose of grading is to offer feedback to teachers for how well they are getting their lessons across, and others say they’re a way of “border guarding,” or maintaining standards of what is or isn’t good work. Overall, Wiley says he is generally comfortable with the grading practices used across campus — even if the average grade awarded by one department is above a 3.9. In fact, one current student who is studying to become a teacher says places such as the School of Education and School of Nursing should consider implementing a pass/fail grading system. “The course work once one gets into these specific vocational programs is designed more around teaching competencies, skills and methodologies specific to the profession and how to effectively work and cooperate with others and less about the competition for individual grades and individual prestige and self-sorting that takes place within other disciplines,” says Joseph Koss, who already has a BS in philosophy and political science, and is in his final year as a secondary education major. The topic of grade inflation is neither new nor unique to UW-Madison. “Grades A and B are sometimes given too readily — grade A for work of not very high merit, and grade B for work not far above mediocrity,” notes a paper out of Harvard University titled, “Report of the Committee on Raising the Standard.” The paper was published in 1894. And according to Rojstaczer, who has collected data on average grades from more than 200 institutions, the rate of grade inflation at UW-Madison is right in line with the averages of other selective state flagship institutions. Rojstaczer, a Milwaukee native who earned his undergraduate degree at UW-Madison in 1977, theorizes the resurgence of grade inflation in the 1980s is likely tied to the emergence of a consumer-based culture in higher education. As tuition continues to skyrocket, students are paying more for the product every year — more often than not, Rojstaczer argues, they are rewarded with a good grade for their purchase. In Rojstaczer’s opinion, grades should serve two purposes: To motivate students and to identify outstanding performers. Not all students need external motivation, he says, but a significant portion of 18- to 22-year-olds do. “If every grade is a B-plus or better, there is no incentive and you end up having a significant percentage of the class that has no good reason to try and excel,” Rojstaczer says in a phone interview from Palo Alto, Calif., where he consults on water issues and is writing a book. In fact, as grades have crept up, the amount of time students are studying appears to be dropping. According to a paper titled “Leisure College, USA,” which was published in 2008 by two University of California system researchers, the average study time for full-time students at four-year institutions across the U.S. dropped from 24.4 hours per week in 1961 to 14.5 hours per week in 2003. More recently, the 2008 National Survey of Student Engagement indicated more than two-thirds of freshman and senior undergraduates at UW-Madison reported spending 20 hours or less per week preparing for class. “When we look at the amount of effort students are putting into their academics, it’s surprisingly low,” says Aaron Brower, UW-Madison’s vice provost for teaching and learning. That, argues Moses, is a clear indication that academic expectations are generally being set too low across the UW-Madison campus. Many of today’s students, however, say it’s ludicrous to suggest they aren’t working hard on their studies and assert the appearance of grade inflation is little more than a myth.